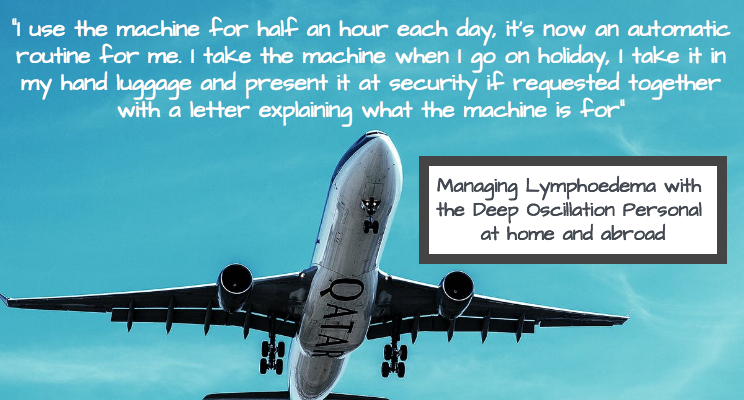 After attending an LSN patient meeting at the Royal Marsden Hospital in 2015, where Deep Oscillation was presented, the patient has now written to PhysioPod to confirm results, her daily routine with the device and the convenience of taking the unit abroad to help manage her condition. "I attended a meeting organised through LSN and Julie and Mary were there demonstrating the Deep Oscillation Personal (DOP) and how it could help with lymphodema. Their presentation gripped me, a short film showed a lady using the machine and how it helped with her leg with lymphodema. We all tried the machine at the meeting and I used it on my left arm with lymphoedema. The electrostatic waves of the machine go down 8 cm and the result is softer skin plus it helps move the lymph fluid. I received treatment at my local clinic shortly after the meeting and then bought my own machine. I have now been using the DOP for three years and I can honestly say that my arm is much more supple, the hardness on my forearm has really softened and the percentage of lymph fluid has reduced. I have also used the machine on my arthritic finger which has been so useful as the arthritis is in my left hand with the lymphodema so it’s not advised for any injections and it’s really helped. I use the machine for half an hour each day, it’s now an automatic routine for me. I take the machine when I go on holiday, I take it in my hand luggage and present it at security if requested together with a letter explaining what the machine is for. The added bonus is that Julie and Mary are on hand with any questions and as a backup for any spare parts. Excellent machine and service. I would certainly recommend the unit for lymphodema." What happens when DEEP OSCILLATION® is applied?